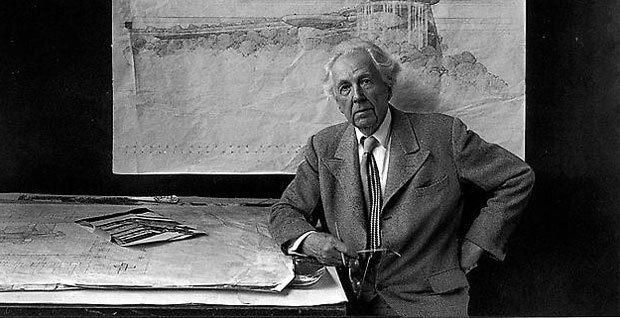 Falling Water House fame architect, Frank Lloyd Wright was born in United States on June 8, 1867. In his early age, Frank moved places quite often with a preacher and musician father and a teacher mother. Frank, an outdoorsy boy was so fond of nature that at the age of 12 he decided to become an architect. Wright attended Madison high school and got enrolled at the University of Wisconsin at Madison to study civil engineering. To fulfill the financial needs, Wright started working for the dean of the department and assisted the construction of Unity Chapel. In 1887 he dropped out of university to pursue his passion for architecture. In order to learn architecture, Wright worked with a number of architects in Chicago and finally found the right one to help him climb up the ladder. He became the assistant of Louis Sullivan and during the same year (1887) Wright carried out his very first project, The Hillside Home School. Then came another turning point when Wright started designing houses independently without the permission of Sullivan. As a result, Sullivan fired him and Wright set up his own office. Wright changed his styles quite often but his initial work displayed Sullivan’s motto, “Form follows function”. Wright’s house in The Oak Park is considered his first masterpiece. This place served both as his home and studio. He originated his revolutionary style “Organic Architecture” from the same place by designing the Winslow House in River Forest. The features of this project that gained most of the fame were its wide interiors, emphasized horizontality and expansiveness. Frank Lloyd Wright earned the fame as the master of domestic architecture. It can be clearly observed that most of his clients were businessmen, moderately successful, practical and independent individuals or non-governmental small institutions. His houses would contain solid masses flaunted by the color and texture of raw stone, brick and copper, with decently carved out punctures playing the role of doors and windows. But soon his idea of simplicity and cubic masses got replaced with his passion for continuous planes and flowing spaces and he started modifying compact blocks into multilayered structures shaped by screens and piers. The professional life of Wright seems to be affected immensely by personal life events. Another event took place in 1914 when a servant set fire to Taliesin (home and estate of that time), causing death of six in total. Everyone saw this accident as the end of Wright’s career but he eventually proved them wrong by rebuilding the estate. The incident was followed by another success when he worked for seven years on another revolutionary building in Japan with a claim of being earthquake proof. He was then proved right one year after the completion of the building when earthquake of 1923 destroyed the whole city leaving Wright’s Imperial Hotel unaffected. Like many other famous architects Wright also contributed in the field of architecture through his writings but main reason behind it was The Great Depression of 1930s. Whatever the reasons were, his books, An Autobiography and The Disappearing City, also brought him fame and made their way to architectural literature.